While the Daytona International Speedway app revealed a few days in advance that the big announcement planned for today’s opening events of the 2019 Rolex 24 Hours of Daytona endurance race, that early information didn’t provide all of the details on this new special edition package. Fortunately, everything that we could want to know about the 2019 Corvette Drivers Series was announced by Chevrolet a few hours ago, so here are all of the key details about these uniquely-decorated Grand Sport models. When it was discovered that Chevrolet would have a special edition announcement for the 2019 Corvette at the Rolex 24 at Daytona, we figured that the package being introduced would have something to do with racing. 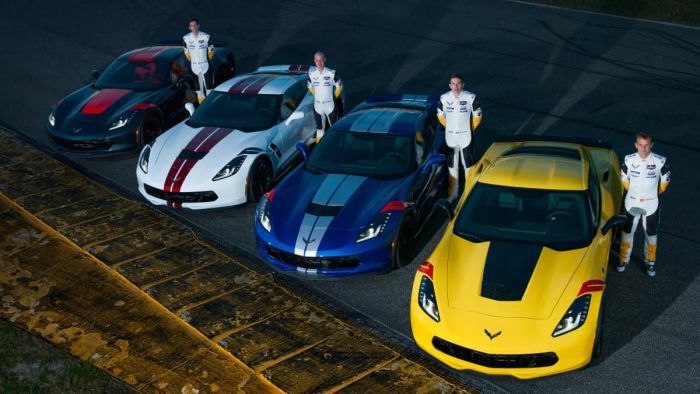 We were right, but rather than just paying tribute to the success of Corvette Racing, Chevrolet is focusing on the four drivers who have played huge roles in the legacy of the program. Over the past decade, Tommy Milner, Oliver Gavin, Jan Magnussen and Antonio Garcia have made the Corvette the leader in production-based endurance racing, winning their class in some of the biggest events in the world – ranging from LeMans to Daytona. Of course, excellent race cars are important, but these four drivers have experienced success like no other modern American racing team and, perhaps no other modern racing team in the world. The 2019 Corvette Grand Sport Drivers Series is, of course, based on the Grand Sport package, powered by the 6.2-liter LT1 V8. The Drivers Series upgrades can be added to the 1LT, 2LT or 3LT trim level and premium options – such as the Z07 package – can be added as well. The key feature of the Drivers Series Corvette is the exterior appearance, although each comes with an interior plaque with the driver’s name on it, along with package-specific interior trim colors. Below, you will find a rundown of each driver-centric package. -Tommy Milner Edition: Elkhart Lake Blue exterior with silver stripes and red hash marks, body-color mirrors, black wheels with red stripe and red brake calipers. Jet Black Suede interior (leather seats on 1LT) with red seat belts. -Oliver Gavin Edition: Shadow Gray exterior with Torch Red center stripe and Torch Red hash marks, Carbon Flash mirrors, black wheels with red stripe, red brake calipers. Adrenaline Red interior with red seat belts. -Jan Magnussen Edition: Arctic White exterior with Crystal Red stripes and gray hash marks, body-color mirrors, black wheels with red stripe and red brake calipers. Jet Black interior with red seat belts; red stitching on 3LT trim. -Antonio Garcia Edition: Racing Yellow exterior with “Jake” stinger stripe, red hash marks, Carbon Flash mirrors, black wheels with red stripe and red brake calipers. Jet Black interior; yellow stitching on 3LT trim. Finally, we come to the pricing portion of this report. Adding any one of the four Drivers Series packages detailed above to a 1LT or 2LT Grand Sport increases the price by $4,995 while the 3LT Drivers Series with more carbon fiber interior trim costs $5,995.